The youngest Halfling Commando made it off Snowy Korthos Island yesterday!!! Panda, previously known as She who makes us Drink, and my cleric, Geekmom Mommybot TM, took off into the explorer area to finish Korthos. We had three quests left to do: Sacrifices, Redemption, and Misery’s Peak. We have been running quests on Normal. I did not want it being difficult for Panda. I want her to enjoy the quests and get used to running her character. I took my laptop downstairs and positioned myself on the couch behind her while she was playing on my computer. This allowed me to be able to hop up and help her if she needed. It also allowed me to watch where she was and how she was keeping up. We started off to Redemption. She helped with the valves to shut off the blasts protecting the Cannith Crystals. She got a bit turned about heading towards the tunnels where Heyton was hiding. Note to self, turn up my gamma when she is running on my computer to make it easier for her to see in the dark. We dispatched the Sahuagin quickly and convinced Heyton to help Korthos. We moved on to Sacrifices to go save Arissa. She helped free the additional prisoners. I had opened the levers and had to step back and let her to do the rest. Geekmom is a little too used to Korthos speed runs. Got to the traps. On Normal, they do not do much damage so I just told her to run through. She said that she had an idea. She timed the blade trap and got through without damage. Go girl!!! We ignored the Arcane skellie to avoid the Mario jumping for her. She freed all the prisoners and sent Arissa on her way home to Daddy, the Mayor of Korthos. Turned in all our quests and repaired. We took a break for me to cook dinner and everyone because Pink insisted that she had no idea of how to run a cleric. Personally, I think she is refusing anything to do with being a cleric. We then had dinner before heading off to rid Korthos of the dragon that has been besieging it. We met the companions at the entrance to Misery’s peak and then went our separate ways. It was a fun romp through the tunnels. She would kill the fleshies while I turned the undead. Always fun to turn undead at the lower levels. I taught her to go for the casters first, then archers, while I handled the undead. It worked well. Many cries of “Go for the Minions!!! !” and “Get the casters!! !” were heard in our house. Got to the part where you first see Aussircaex in all her glory when the adventurers get her attention. Panda wanted to fight the dragon. Later, little padawan. Later. I had her stop when we were running over the ice sheet so that I could hop until and show her Aussircaex running under the ice below. The excitement and joy was awesome. Those types of moments in the game make DDO awesome. Especially when seeing for the first time. Very cool to see through her eyes. Finally, we completed the run to find the MindFlayer and Dragon locked in a battle of wills. We took our positions around the Quori Mindsunder and waited for our chance. She could not hear the battle of wills with Darastrix Achthend. She was worried that the sound would cause anxiety so she left my headset off. We got the signal and destroyed the Quori Mindsunder. We then watched Aussircaex take her revenge on the MindFlayer as Darastrix Achthend shattered into pieces. We met up with Jeets, that tricky rogue, and then joined the rest of the group with Heyton. We then took the Dimension Door out of the quest and got our lovely XP. She was excited when she zoned out of the quest and saw that the splash-screen had a sunny Korthos instead of the snowy one that she was used to seeing. She quickly turned in her end reward and took the ship out of Korthos. I sent her an invite into the Halfling Commandos guild and took her on the airship. She keep trying to stop at every quest giver between the docks to take their quests, but I told her to wait. She was very happy to get off of Snowy Korthos. I think that our next plan is to head into Cerulean Hills and visit Baudry Cartamon to help him out in the warehouse. This entry was posted in Gaming, Geek Parenting and tagged anxiety, Autism, DDO, geek, Geek parenting, padawan on March 31, 2017 by judyenaz. 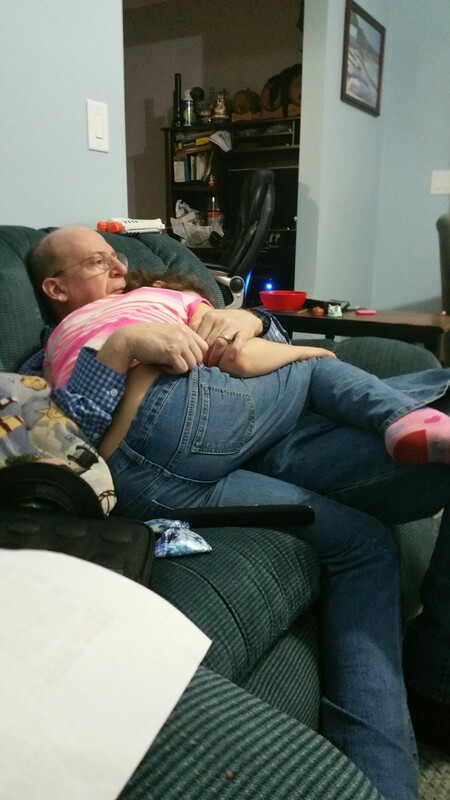 There comes a moment when you look over and realize that your husband might be late for guild night…..
Pink’s sister needed some cuddles from Daddy tonight. Cutting it close on Guild Night. I don’t think Daddy minds a bit…. This entry was posted in Geek Parenting and tagged Autism, Cuddles, DDO, Geek parenting, Guild night on March 21, 2017 by judyenaz. There is a vulgar three-letter word right now in DDO. It was bandied about prior to the server move, but has become quite commonly yelled in party chat, general chat, DDO forums and blog posts. However, in light of this, I am not writing about it. I am writing about DRESSES. Particularly the dresses that I am making Pink and I for PAX EAST 2016!!!! I am giving enough warning for those who may be less than impressed with fabric choices a chance to move on from my blog post today. But for those interested, READ ON! Pax East tickets went on sale while Pink was in the hospital. It was a week after her emergency surgery and were bought as a bribe to make her smile. Coincidentally, it was last day of her running post-operative infection fevers. She was the envy of her older cousins at Christmas when she announced that I was taking her to Pax East. Her cousins are 30, 28 and 24 so she felt quite special that they were jealous. But she was still recovering, so no flushies were threatened. Have I left enough room for those not interested in fashion to back out? Oh well, if not, consider yourself warned. Pink has been trying to decide what to wear to Pax East. She is really hoping to meet some folks from DDO there. And as she is a 12 yr old girl, outfits are important. She really wants a pink wig that I can style into her character’s hair. Ordering the wig is easy. Hairstylist, I am not…..
Now, back to questing for the perfect gaming fabric. I thought that the Pokemon choices were slightly childish. And she agreed. We were looking at the Mario when something caught my eye on an end-cap. It was a Link fabric. But not the cartoony Legend of Zelda characters, but something darker and with more substance. She fell in love with it!!! We are doing pattern D with contrasting godet. Godet for those not in the know, is the contrasting panel on the dress. We went with a gorgeous olive leaf print. It matches Link’s tunic and cap perfectly!!! She is extremely excited and wants this dress done yesterday. I think I know what I will be doing on my lunch break. This entry was posted in Crafting, Gaming, Geek Parenting and tagged DDO, Doctor Who, gaming, Geek parenting, Mario, Nintendo, Pax East, Turbine, Zelda on March 22, 2016 by judyenaz. Some lessons have to be learned…. We finally let Pink play on a school night last night. It was the first time in months. After what she went through in November and recovering throughout December, she had decided she missed the hospital and spent the first week of January in the hospital with pneumonia. Bad Gamer Child!!! Pink is now level 15 and we really want to get her to epic level to have her run some of the more fun raids with us. She really wants to run Fire on Thunderpeak. She sits behind one of us each Friday night and watches it like TV. Geek Dad really wants to get her into the Shroud, heroic of course. We decided that last night was a perfect night to knock off one of the pre-req quests. We decided to try Rainbow in the Dark. We had two groups running in the Halfling Commandos which for us on a Wednesday night is AWESOME. Geek Dad and I brought out our original guild characters, Wire and Theadora, who are in our guild Torchwood. Yes, we are THAT geeky. Rainbow went really well. I had the glow stick which required Pink to stay close and not zerg ahead. Best way to stop zerging! We ran into a problem with the jumping to the pillars over the spikes. Geek Dad had to help Pink. He reset her settings to make it easier to see and she was all set. No deaths up to until the named beholder. I had moved up enough while pulling back the rusties to find him. Pink shouted out, “I want to get him” and ran forward. Some lessons a parent cannot teach a child. They must learn them on their own. Running ahead towards a beholder just happens to be on that Pink learned last night. We made it quickly to the end where I got to make sure that Pink remembered her Rainbow colors. She did the puzzle on her own. I popped in the glow stick. The end boss showed up and was quickly dispatched! Recalled and sent Pink off to bed. She is still building back up her endurance and needs the rest. All in all…..a good night to be had. 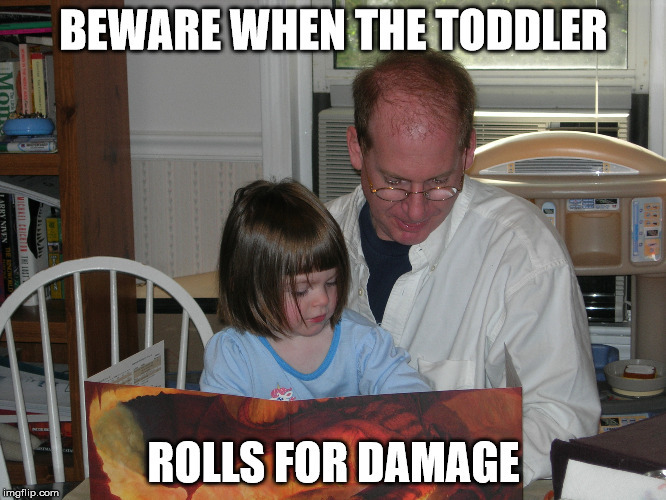 This entry was posted in Gaming, Geek Parenting and tagged beholders, DDO, gaming, Geek parenting on January 28, 2016 by judyenaz. Our younger daughter has Autism. She was diagnosed at 28 months old and at that time was non-verbal. She has since found her voice but still struggles with being Autistic in a world not meant for her. We sometimes think that she belongs in a slightly more simpler age except there would be no internet which she would not find amusing. She is very smart. To give you some examples, she used her Dad’s ATM pin code to unlock the parental locks on her DS so she could get to the internet. At eight years old. At nine, she figured out how to switch internet servers in our house so she could get online before 7AM. At the same age, she figured out that if you surf through YouTube favorites, you can bypass the YouTube block that your dad put on the servers. I could not get to YouTube, but she could. If she only used her powers for good….. Lately there have been a few articles about Autism and D&D which I find very exciting. The idea of being able to share something with her that means so much to us is very enticing. The articles talk about how empowering the game is for them. It is would help, in my opinion, as social stories. I want to share a few of these. There is a great article that talks about how D&D saved the life of his autistic son . It is a great story. Also, on Pixelkin, there is a video on Autistic teens finding a safe place in Dungeons and Dragons. Another interesting article involves a 12 year old boy who helped his scientist dad use D&D to help identify Autism. I am hoping to get my younger daughter interested in playing. She is only ten, so she is on the young side. Gamer Child got the D&D Starter Set for her birthday perhaps we can all learn together. I talked to her HBTS worker yesterday and she was interested in learning as well. So looks like a plan! Very excited to see if she is interested. I will keep you posted! Footnote: I used the term Autistic rather than child with Autism for a reason. I have read that adult Autistic people usually refer to themselves as such. Saying a child with Autism is treating it like a disease rather than the complex neuro differences. As I respect my daughter and the community that she belongs to, I use that term instead. My apologies to those who do not feel the same way. This entry was posted in Gaming, Geek Parenting and tagged Geek parenting on September 28, 2015 by judyenaz. Monday and Tuesday morning in our Geek family was rough. We were having a FA couple of days. Those not in the know, FA stands for F&&K Autism. My gamer child was showing some stress from it so while her sister was out of the house, I bought her The Sharn Syndicate expansion pack and took her on an adventure. DDO has helped me reduce much of my stress from real life and I needed to give my gamer child some much needed one to one attention. Geekdad was on a conference call. So Off we went! Stand Your Ground with Maxwell Statler went swimmingly on Hard. We were both level 6 so I decided to ramp up the difficulty. We had done all of 3BC on Normal because I wanted her to enjoy the game, not feel it was too difficult. Next we ran over to Dirty Laundry. I grabbed a hireling rogue to help with the traps. She was not a bright bulb. She liked to stand IN the trap while looking for it. Either that or she really enjoyed the spike trap in a personal way. But the trap was disabled. The quest completed. We were on a roll. The Stormreaver Fresco was next on the list where we were betrayed by that warforged, Zircon. That dirty rat! But we made it out of the bank without a problem. Even on Hard. Next up was The Bookbinder Rescue. I had our useless hireling rogue to assist. First fight, one of the Binders offed herself in the trap. Thanks for waiting to be rescued. Geekdad was off his conference call so we dragged his rogue into the quest with us. First try, Grammah appeared in the hallway while we were in the rooms fighting. Dead. Take 3, we kill off everyone but Grammah Binder decided to bug and fall on top of the bookcase. She had fallen and could not get up. No matter how many times we tried, the old crone refused to budge and leave the house so that we could end the quest. Sigh….. So, that taught my gamer child two lessons. One, quests bug. Two, in-game support never showed. So off we went to try Take 4. Success. Grammah leaves the building. XP is awarded. Only took four tries. Repossession went easily. Geekdad removed all the traps and we got maximum XP. SWEET! We finished The Sharn Syndicate. I had gamer child take the Nicked Longsword which she now LOVES. This entry was posted in Gaming, Geek Parenting and tagged Autism, DDO, gaming, Geek parenting, The Sharn Syndicate on July 31, 2015 by judyenaz.